We offer for your inspection the exhibition display, above, containing original keys to the infamous Confederate Civil War POW Prisons of Castle Thunder and Libby Prison belonging to Lt. 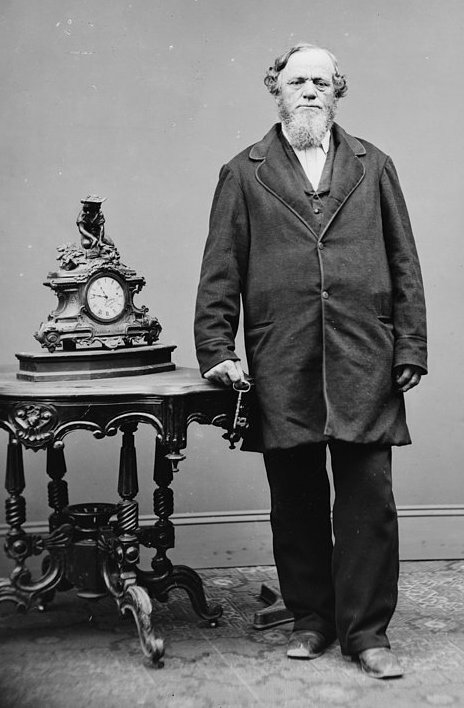 Colonel Lucius V. S. Mattison – named in various reports as the “liberator” of Castle Thunder and the first Union Officer-in-Charge of both Libby and Castle Thunder, immediately after the fall of Richmond. 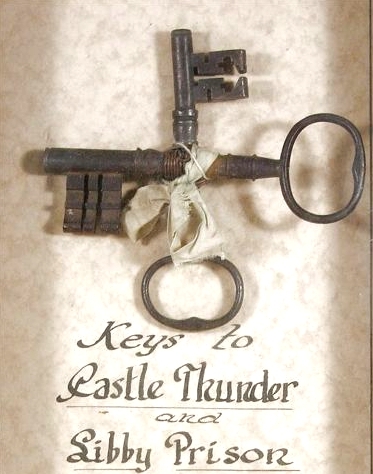 The key to Castle Thunder offered here is THE most extensively documented and publicized (in 1865 and later) example of a Confederate Civil War prison key. It was even photographed in 1865 when it was offered at auction for the benefit of War Orphans shortly after it was brought north by a prisoner released by Lt. Col Mattison from Castle Thunder (a scan of that photo will be found below). Lucius V. S. Mattison was mustered into service in December, 1861 as a private in Company D of the 81st Regiment, New York Infantry and served throughout the Civil War raising to the rank of Lieut. Colonel when mustered out in July of 1865. Mattison has been called the “liberator” of Castle Thunder and various reports during and after his lifetime report that he possessed well-documented keys to both Libby Prison and Castle Thunder– the very keys being offered here. He was also a prominent member of the Grand Army of the Republic throughout the later years of his life. These two large and heavy, brass and iron Keys are contained in a hand-made, shadowbox display, which dates from 1954 when the Keys were part of a Memorial Day exhibition of Civil War mementoes belonging to Lt. Col. Mattison at the Fairport, New York Public Library in 1954. By elimination, we then were able to rest assured that the key mounted horizontally in the display is the key to Libby Prison. We were unable to discover any Civil War period reports regarding this key, but we can only assume that Colonel Mattison secured this key himself while serving as Commander of these two notorious Confederate prisons. 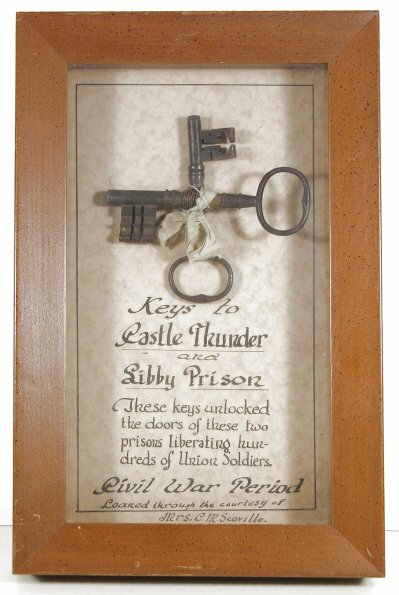 The National Civil War Museum in Harrisburg, Pennsylvania has in its collection a key purported to be the “Key to Libby Prison.” At least 3 other “Keys to Libby Prison” were reported to be in the hands of various Civil War veterans (most being ex-prisoners at Libby) in the years after the Civil War. In refuting the claim of one northern soldier that he held the “Key to Libby Prison,” a Richmond newspaper in 1865 stated “there were certainly many keys to many doors at the prison,” and we certainly must agree here. We cannot state for sure that this was THE key to Libby Prison, but given the facts surrounding the Civil War service of its original owner, we feel that there is no doubt that this was “a Libby Prison key.” In fact, of any of the numerous keys that are purported to be the key to Libby Prison, one owned by the first Union Army Officer to turn that key and liberate the wretched prisoners confined there, as well as the first Union Officer in charge of that prison after the fall of Richmond, seems the most likely to have been truly THE key to Libby Prison!!! “Mrs. Charles Scoville has generously allowed the Perinton Historical Society to display some of her family treasures from the days of the Civil War. With the cooperation of Mrs. Gaffney these articles will be in the display cases in the Fairport Public Library during the last two weeks in May, over Memorial Day. The great-grandparents of Mrs Scoville, Solomon and Lydia Mattison, took up 500 acres of virgin forest around S’criba. They lived in the blockhouse at Fort Oswego while their log house was being built. Her grand-parents had two sons, Malcolm and Lucius Van-Scoyke. Malcolm went to sea and died on a whaling expedition in the South Pacific, before the Civil War. “When Fort Sumter was fired upon and President Lincoln called for troops, Lucius, her father, a lad of 17, enlisted and served throughout the war! Col. Mattison was promoted to Major for bravery on the “field” at the storming of Peterborough Heights. On April 3, 1865, the 81st Infantry with Lieut. Col. Mattison in command were the first to enter Richmond. His hands pulled down the Stars’ and Bars and raised the Stars and Stripes instead. These are the two flags on display in the library. 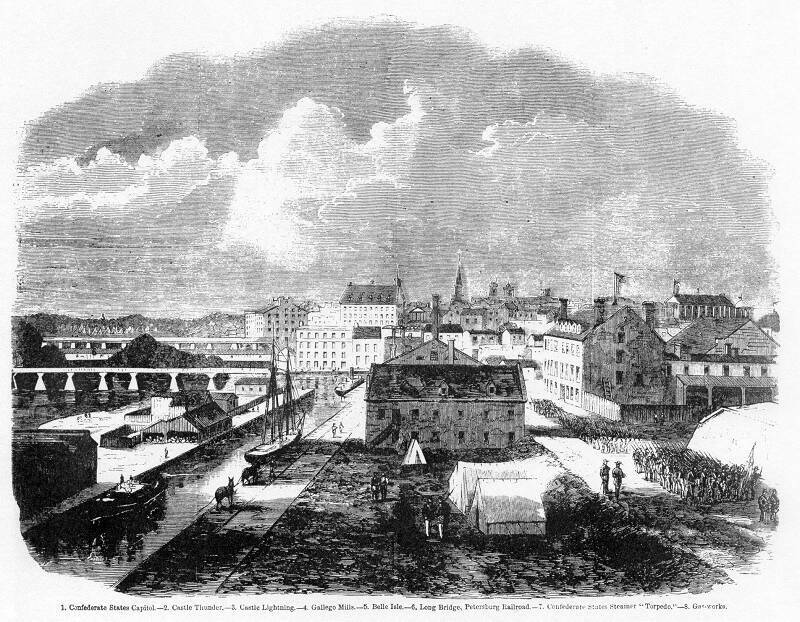 He and his men were placed in charge of Castle Thunder and Libby Prison. He liberated about 400 Union prisoners and soon had his men guarding 2500 rebels in their place. After two weeks In Richmond the 81st Infantry went to Williamsburg where they remained until mustered out and sent home. While in Richmond “he shook hands” with President. Lincoln who had come to inspect the field. This entry was posted in American Civil War and tagged american civil war, castle thunder, civil war, important military antiques, libby prison, lucius vs mattinson, military history, richmond virginia, war memorabilia. Bookmark the permalink.